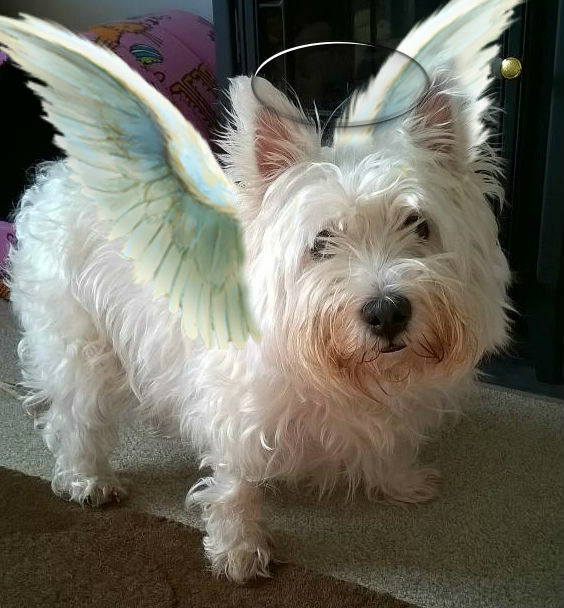 There are a few instructions on da net for DIY hoop or halo coats for blind dogs. I found this one which seems quite a good one, and easy to make at home, if you're hooman has the necessary skillz. 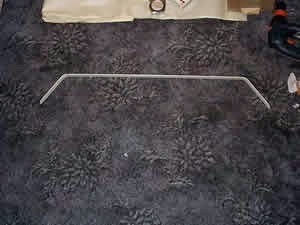 A - Aluminium strip of the correct size. For alternate materials, see the end of the article. SIze: Add measurements A and B, multiply by 3. 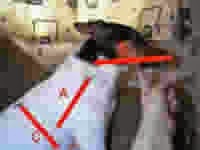 In this example: (5+8) X 3 or 39 in. B - Leather Harness, to fit chest. Rremember that blind dogs tend to put on weight. Grind or file the corners off the aluminium strip to make them round and smooth. 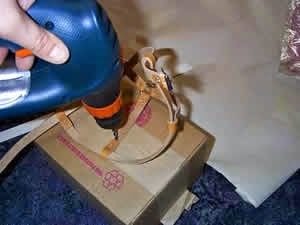 Use sandpaper to finish. 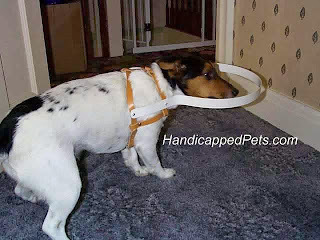 Put the harness on the blind dog and adjust for a comfortable fit. 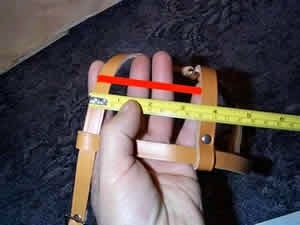 Measure the distance from centers of the vertical straps. 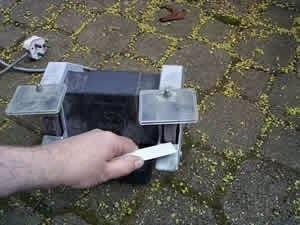 This is where you will be attaching the aluminum hoop. In this example, it is 3 1/2 inches. Drill four holes in the Aluminum strip. One hole in each end 1/3rd inch from the end, then another pair of holes 3 1/2 in. (in this example) in from the first from the first. Remember, use your measurements in place of the 3 1/2 in. Drill the harness on lower part of neck vertical strips where you measured. This is where the aluminum strip will be attached that will warn a blind dog that he is about to bump his head. Make a 45 degree angle bend in the aluminum Distance A from the ends. In this example, it was 5 in. 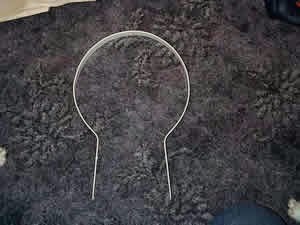 Then gently bend middle as shown to make the hoop. Rivet the hoop to the harness. In the front vertical harness straps only. 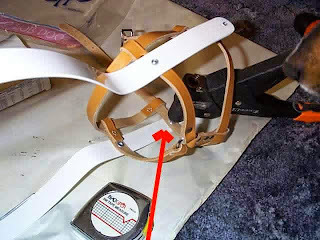 This is so we can adjust the height before attaching the blind dog hoop to the back strap of the harness. Rivet goes from inside of harness, into leather, then into aluminium. 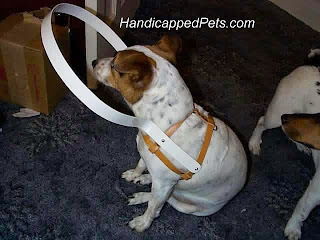 Now put harness on dog, lift hoop so when the dogs nose is level, the hoop is level with eyes and nose. Mark the back strapp of the harness through the hole you drilled in the the aluminium. Rivet the back strap and the aluminum hoop from the inside. The blind dog hoop harness is complete. 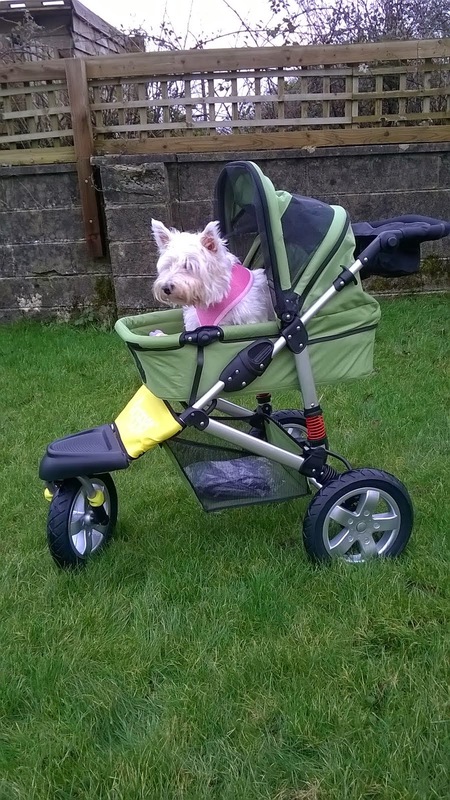 Give your dog a little time to adjust to it. He may be a little confused at first. Thanks to Bruce, who is not a blind dog, for modelling, and being patient! Here is the real master of the blind dog hoop, Pepe, trying it out. 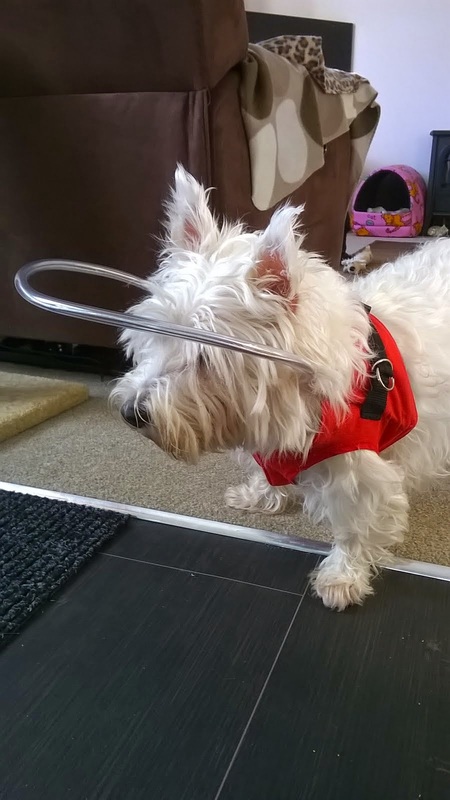 There are many different materials that can be used for the blind dog hoop and the harness. 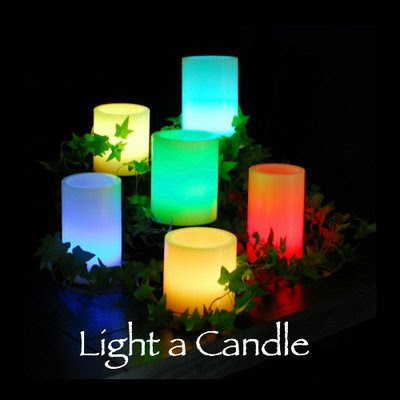 Any other lightweight, bendable material that will hold its shape. I made one from polypropylene webbing, machined it together, and had to use cup washers under rivets. Some people have had trouble getting leather harnesses, so nylon is ok, as long as the weave is tight, and washers are behind the rivet heads to stop the rivet going through the material. But I would recommend leather, it will last longer, and with wear will become soft. The only thing that may not be clear, is the end of the aluminium is rounded off to a "ice Popsicle" shape, and the hole is 8mm (1/3 inch) from the end. 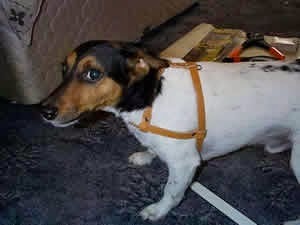 Then if dog wearing harness bends, that rounded end pushes into harness, not dog. That aluminium needs to be about 50 inches, by 1 inch, by 1/10 inch, for a Labrador. 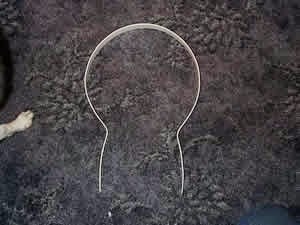 Also some people have used carpet-joining strips for the hoop, the type without grips, which is screwed to the floor. 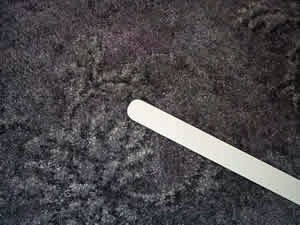 Make sure if you use this that the part that would have gone uppermost if it was used for carpets, is on the outside of the hoop. Sorry for metric sizes, 25 millimetre is 1 inch. The rivets are 3/16 inch, 1/8 to 1/4 reach (about 1 dollar for 15). 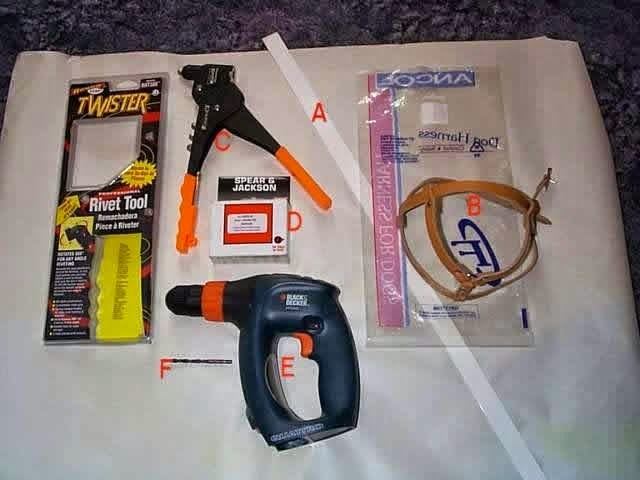 To save buying a pop rivet gun, car mechanics carry these (especially body repairs), but I would recommend buying one because they are cheap, and repairs will be necessary, if your dog gets excited like my Pepe.